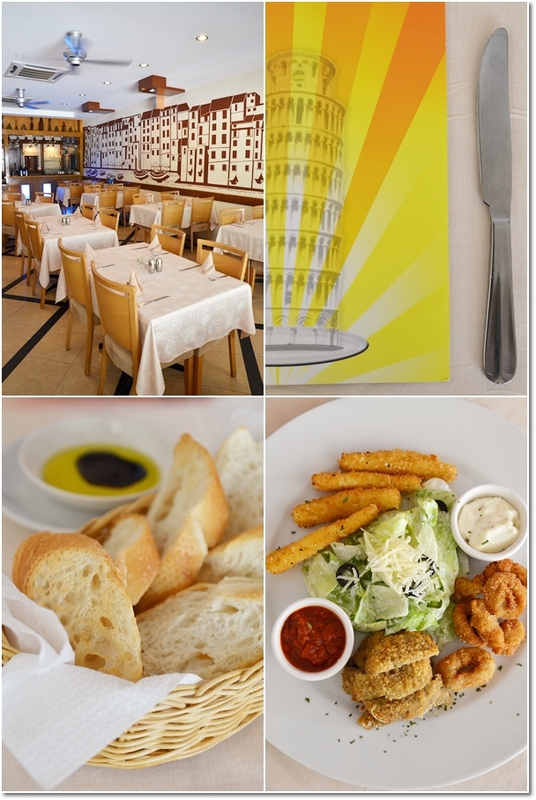 Italia Mia @ Sunway City, Tambun – A refreshed coat of paint; complete with an artistic touch on the mural of the Grand Canal to create that mood …..
Italia Mia has graced the dining scene in Ipoh since more than half a decade ago. In this last review of the restaurant located in Sunway City of Ipoh, close to two years ago, the owners did mention about their intention to sell the restaurant off and move back to Europe to be with their children, but little was heard about Italia Mia again … especially since I myself left Ipoh at the end of 2010. And come 2012, they finally did it. 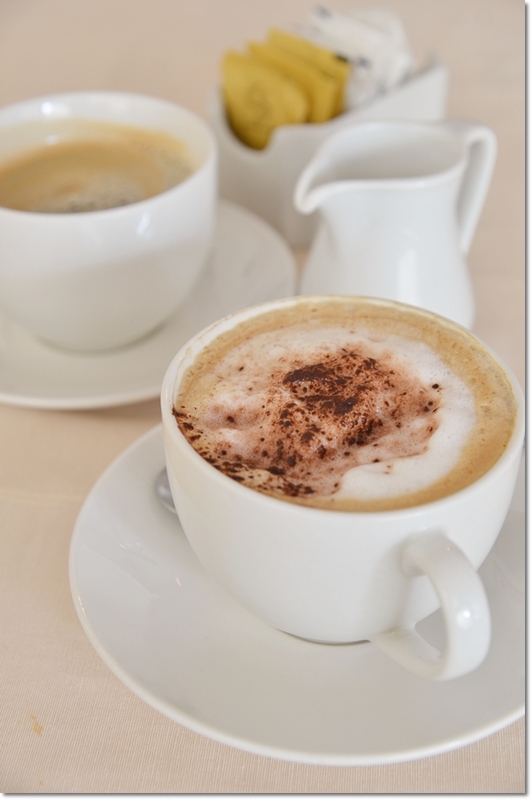 Italia Mia has now changed hands; sold off to a bubbly Chef Kenny and his partner. Wondering what has changed aside from the ownership and kitchen crew? Read on to find out. 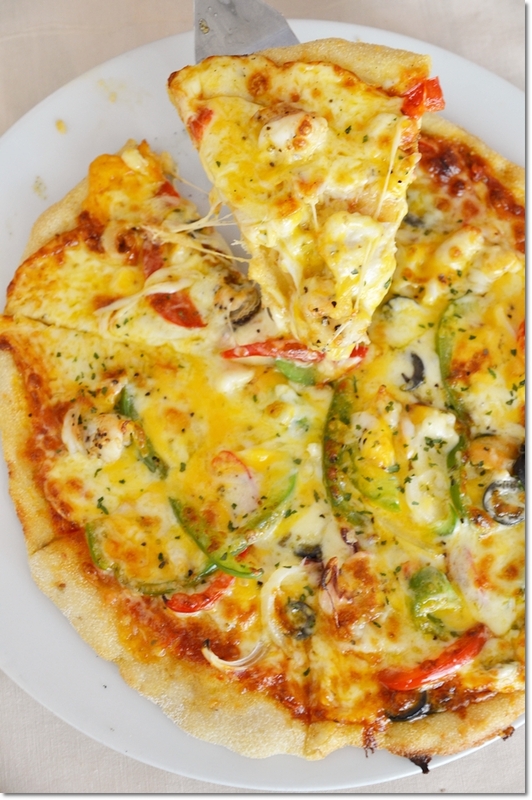 Treasure From the Sea pizza (RM25/USD8) – With prawns, squid and mussels, embedded into the web of mozzarella cheese loaded with tomatoes, onion, capsicum and olives. The pizza dough had this chewy quality to it; with a crusted edge fresh from the oven. The layout of the restaurant remained unchanged; with slight modifications to the arrangement of the tables and chairs (Kenny : I love having a sense of space between diners, yet without the routine layout of a boring cafeteria), a newly-painted mural of Grand Canal on one side of the wall, and minor adjustments to the paintings here and there. The bar is still there at the back of the dining area, as well as the frosted glass panel fronting the premise bearing the trademark name of “Italia Mia”. Most glaringly, the menu has changed. I daresay, drastically. 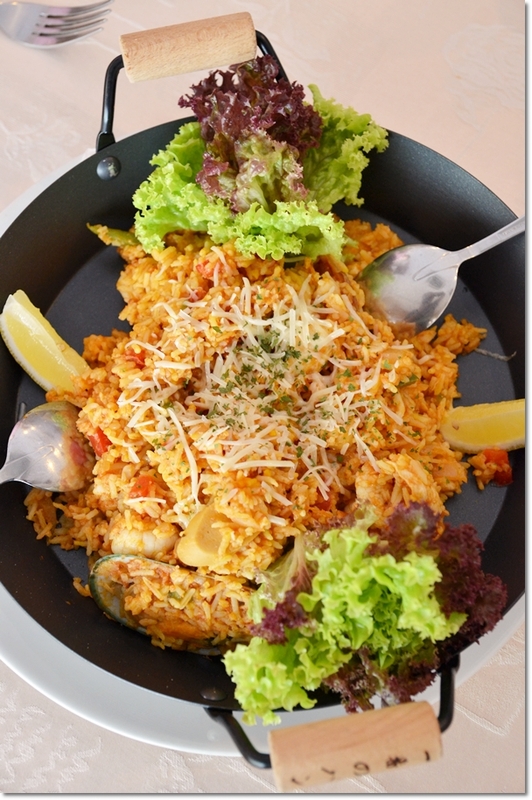 Spanish Paella (RM46/USD15) – To be shared among two, the glorious serving of saffron-perfumed rice (Basmati was used) with chorizo sausages (chicken), chunks of chicken and assorted seafood came with wedges of lemon and shavings of parmesan in a pan. Used to be solely ITALIAN cuisine enlisted in their repertoire. But Kenny had more than 27 years of experience in various F&B establishments; ranging from his 7 years stint in Europe, to Shangri-La in Kuala Lumpur, Hard Rock Hotel in both central AND the relatively new one in Penang, as well as close to a decade of working experience based in a hotel in East Malaysia. That was when he learned the ropes from the matron behind the famous Little Italy restaurant in Kota Kinabalu, Sabah. The rest was history, so to speak. 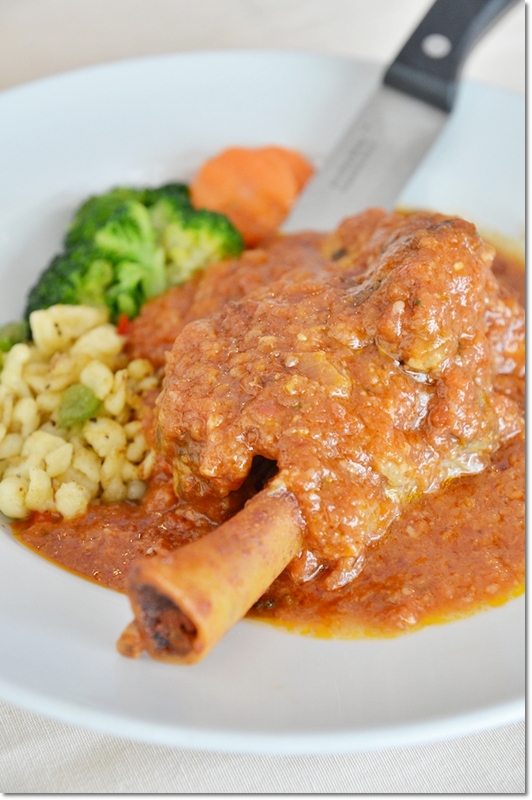 Lamb Osso Bocco ala MIlanese (RM46/USD15) – A huge portion of lamb shank cooked to a tender perfection, bathed in the gloriously tangy tomato-base, thyme truffle sauce. The yellow bits on the side were egg barley; something concocted from the creative mind of the chef. A simple menu mimicking the original Italia Mia’s, they serve 8 types of appetizers (RM8 – RM20 each), 5 types of pizzas (RM18- RM25), 5 types of pastas (RM18 – RM25) and 5 choices of mains (RM35 – RM48). The prices have been tailored to a seemingly customer-friendly range, a deviation from the original Italia Mia with prices of all mains and pastas above RM30/USD10 or so. We started off with a Combo Platter (RM20/USD7) made up of fried mozzarella sticks, fried portobello mushroom and deep fried calamari served with a tub of garlic aioli and a tub of fresh marinara dipping sauces. A small portion of Caesar’s salad was also included in the ensemble. Best to be shared; as this is a sampling platter to try the various starters they offer. 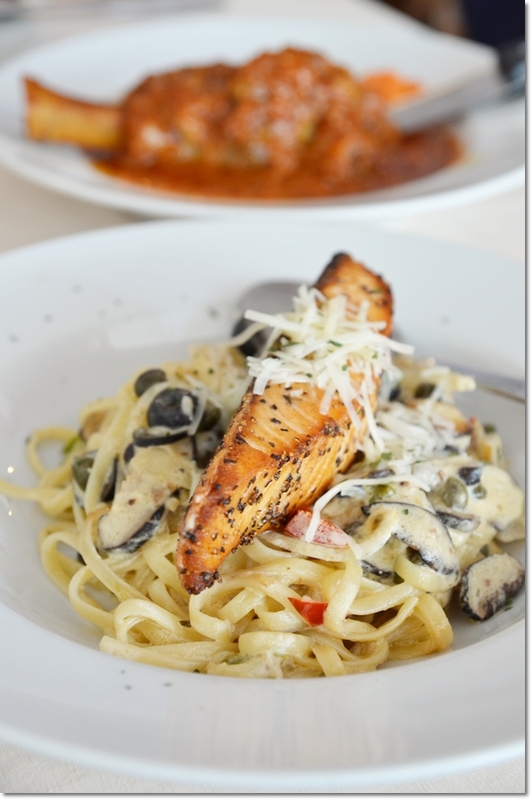 Grilled Salmon Pasta (RM20/USD7) – A beautifully charred, and crisp grilled salmon on a bed of linguine cooked in a creamy, Carbonara sauce with capers, mushrooms, olive oil and sun-dried tomatoes. The mains came in succession thereafter, with the seafood pizza arriving in a portion that screamed for sharing only, a humongous lamb shank smothered in a fresh tomatoes-based sauce, an equally huge portion of paella with seafood and chicken, and the delectable grilled salmon on pasta. The grilled salmon with lightly-charred, crispy skin was a delightful take unlike the usual flakes of the pink flesh scattered in most pastas with salmon. The creamy sauce laden with the acerbic tinge of capers was slightly dry though; could be due to the elaborate shooting period, plus the mains coming in at breakneck speed. I would prefer it had they reduced the amount of capers used in the serving; to minimize the overwhelming sourish tinge to the dish. The paella, lamb shank and pizza were all above average; with the lamb shank taking the icing on the cake as the highlight of the meal. A little bit tougher than fork-tender quality, the shank was cooked to a firm finish, then served in copious ladles of a zesty thyme truffle sauce, and chew bits of interesting ‘egg barley’ on the side. The paella had more chicken and chicken chorizo sausages than prawns and mussels, yet the use of the expensive spice; saffron lent a cheery highlight of orange and subtly accentuated the taste of the dish. And guess what coffee they serve here? Starbucks. Really. Ending the meal on a low key was a cup of cappucino brewed from Starbucks coffee beans brought in by his partner from the US. Still prefer Illy, or even Lavazza over this, but at least they did not resort to flavour-less beans sourced from the supermarkets. Italia Mia still serve desserts; from Tiramisu to Creme Brulee, and even Kenny’s special creation of Fruity Pizza with dollops of sour cream. Yet, he was quick to admit that desserts were never his forte, and he is still in the midst of finding his identity in this segment. Refer to the previous post for directions and MAP. Business Hours : 12pm – 3pm, 6pm – 10pm. *Motormouth dined as a guest of Italia Mia’s, an invitation extended by Chef Kenny. No monetary compensation was received. Am using a Nikon D7000, Chan. Yeah .. the pork was good, maybe to cater to a more diverse crowd now? Nice one to check out! Truthfully, I prefer the one at The Limestone’s. Maybe for the fact that the ingredients loaded into the famous Spanish rice dish are different. However, Italia Mia’s version is cheaper by a third of the price, so I can understand that this may not be an apple to apple comparison. Ehhhh… I have being told the chef left Limestone… not worth to go now? I knew it KH, but did you know it was half year ago. I’ve been there few times and also during valentines, i can said their chef kept it well, the food quality doesn’t drop but also improved alot. After all, we just want good food, as long as the food is good, who cares who is the cook…? True. I personally miss Italia Mia’s classic Italian creations and the delicious profiteroles and creme brulee, but I’ll have to say that Chef Kenny did a pretty good job himself in interpreting European cuisine his way. Which chef left Limestone? Sorry for late reply. Was away for holidays. The Canadian chef? I’m not sure, but not seeing him for half a year already. When asked the staff there, they told us their chef when on a long holiday for culinary exposure…? So, i assumed he left already. I have higher esteem on their current chefs, as the restaurant is still going on and somehow getting a lot better without him. I still prefer good old Mom’s italian cooking. Call me old-fashioned but i cant eat out at too many italian restaurants because of that. They just don’t cut it! Yes, CK. I guess the longing’s gonna be tough. The old Italia Mia was a great place for authentic Italian cuisine, really. CK, I strongly agree with you… I just back from dinner at this New restaurant… food is not too bad if we are not comparing with the old one. Furthermore, with the price we are paying now, the food is acceptable. 3 failures…. Tiramisu…. Old Italia Mia has the best Tiramisu I had in my life till now…. The other one is Coffee / Tea as my ending of the great dinner… all of us getting warm coffee & tea …but we are ordering HOT Coffee / Tea. Anyway, I will still go back for the food since not too bad….. Thanks for the feedback KH. Price-wise, yes. Definitely more affordable now compared to the old Italia Mia. Maybe let the new management grow a while before they keep up with the expectations. i’ve wide experince in italian food n alsa work as rest manager in one famous italian rest in johor which is a fefourate sport for johar royal family. any vacancy for me in your restaurant? i was ipoh boy n have great kitchen crew as my downlines..do contact me if you need me. thanks…. shah 0142415690. Am thinking of taking my sis there but she does not take any beef, lamb, cheese and cream! Do they serve any chicken/fish dishes without cheese and creamy sauce?